Morning broke early today with a beautiful crisp sunrise. It was chilly enough last night to run the furnace a bit and everything performed very well. We each got in a shower and even did a bit of laundry before heading out. 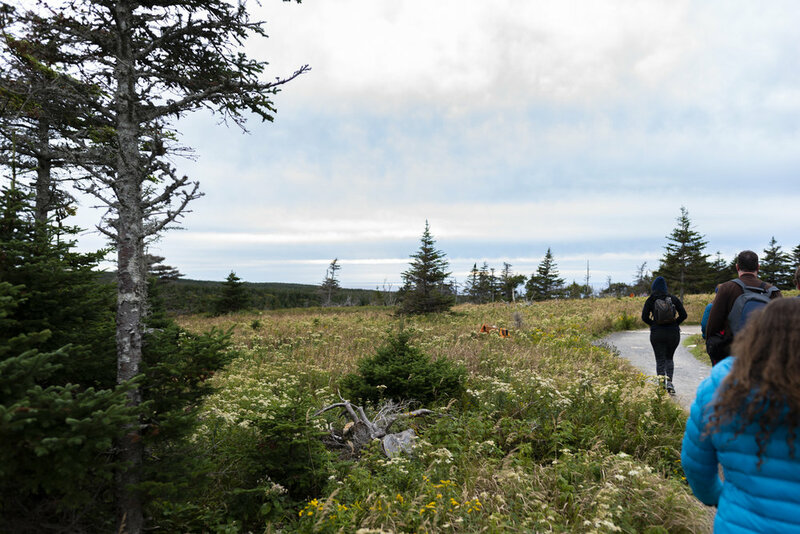 We didn't have far to travel to get to the Cabot Trail so we decided to make it a leisurely trip. Cheticamp is the village right at the beginning of the trail. What a beautiful morning. . . Unlike all the Scottish and Irish we had been seeing, Cheticamp is French, Acadian actually. The signs here are both English and French and it seems that everyone has an accent. We stopped at the local co-op food store and picked up a few more things, parking here was very challenging as there was not a lot of maneuvering space. Later I stopped for gas at the local, tiny, gas station which is always interesting with the trailer, but a bit more so this time. There was not much space between the pump and the building and not much turning space space when I pulled out. 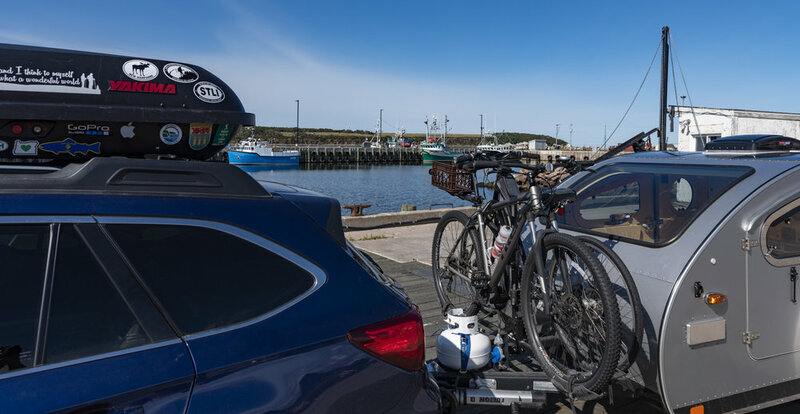 When pulling any kind of trailer you should always scout out the gas stations to make sure you can navigate them without incident..this was the only gas station we found in Cheticamp. Everything worked out. Without having an actual plan was we headed toward the National Park. 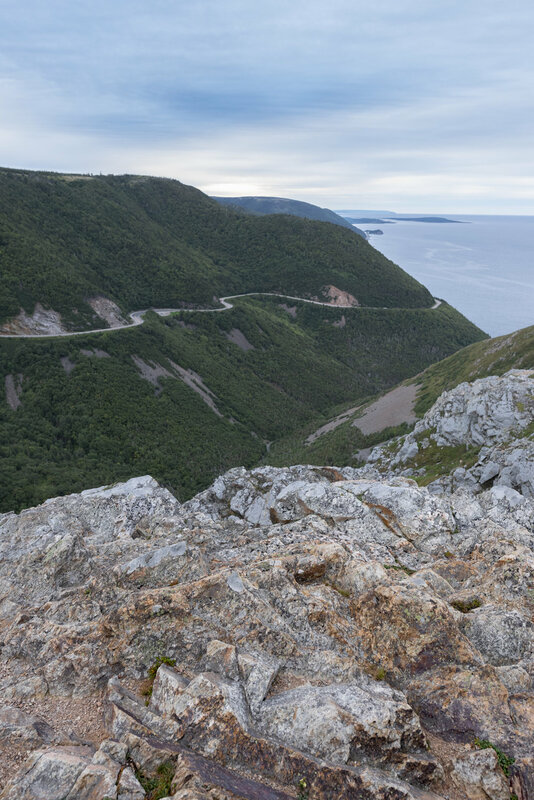 We made it to the Cape Breton Highlands National Park entrance just around one in the afternoon. Inside the visitor center we chatted with a ranger, got registered and looked at all the maps and through the gift store. We found our site and got settled into camp. We had made reservations to take an interpretative sunset walk along the Skyline Trail, which we have heard is the best trail in the park. We were camped next to a tiny tent and just across the rod to the showers and rest rooms, very convenient. 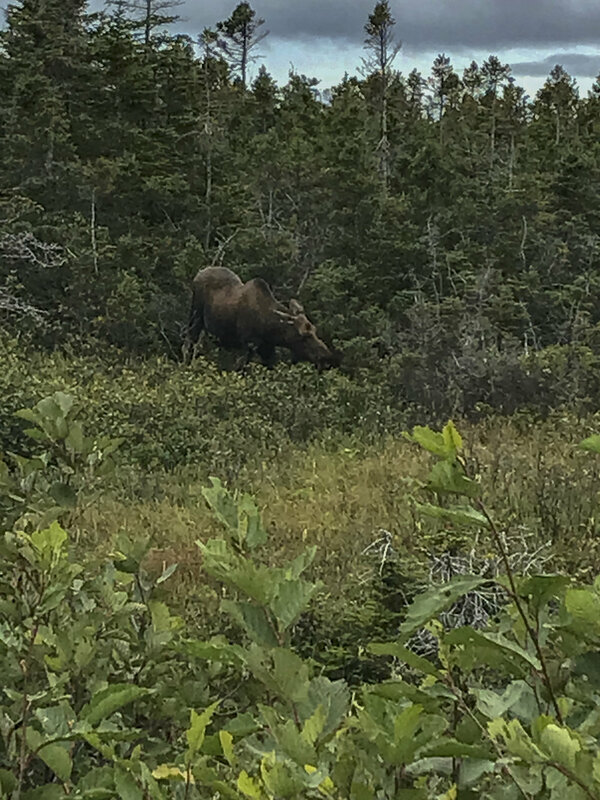 Moose on the side of the trail. We had a bite of lunch, got the Clam set up and the afternoon just fell away and soon it was time to head to the trail. The 15 minute drive to the trailhead of the Skyine Trail was an uphill twisting and turning road which was awesome and I felt like I was driving a sports car, not having the trailer attached. We met the ranger at the trailhead at 5:00 - also waiting at the trailhead was a moose! Walking the skyline Trail..nice easy hike. This was our first encounter with a moose on this trip and hopefully not the last. She was huge and grazing just along side of the trailhead. A crowd had gathered to watch and take pictures, we did the same. The ranger gathered us all up, about 8 or 9 of us, and we headed off up the trial. The hike was fast paced but so very interesting. Courtney, the ranger, explains things for us novices. 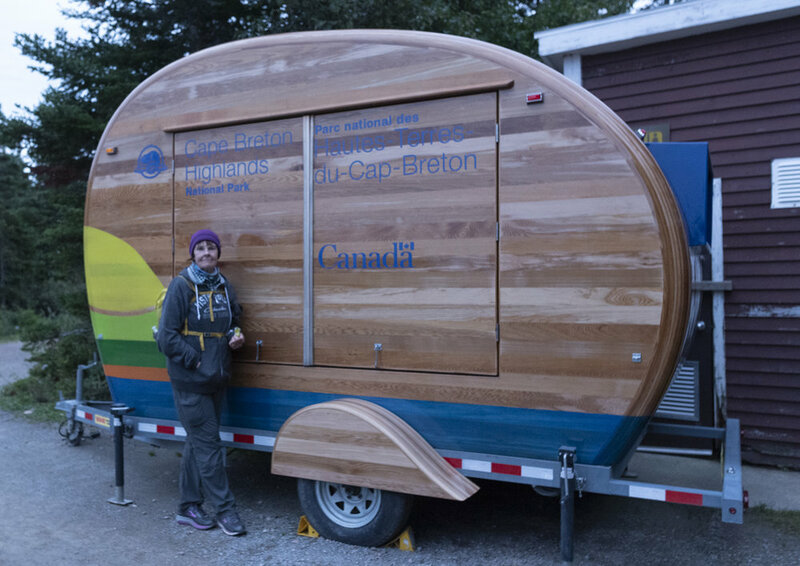 . .
Courtney, our young Acadian guide, was informative and really knew her stuff. 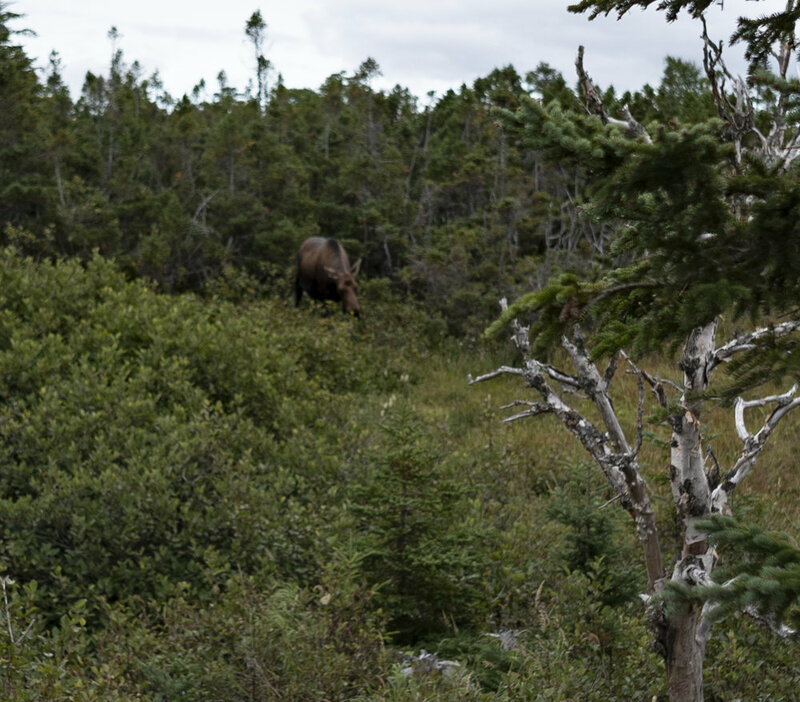 We now know more about moose and boreal forests than we ever could have imagined. 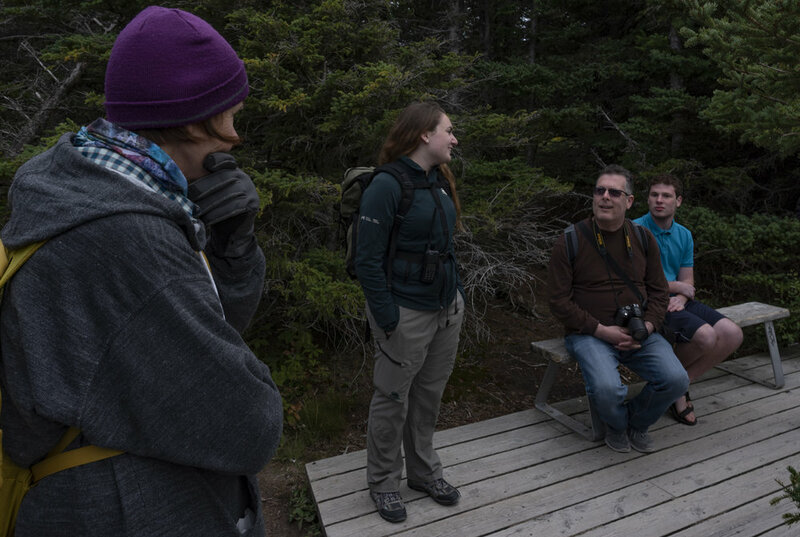 We made several stops along the trail to look at some natural feature or another, to examine trees and flowers or to take in a view. 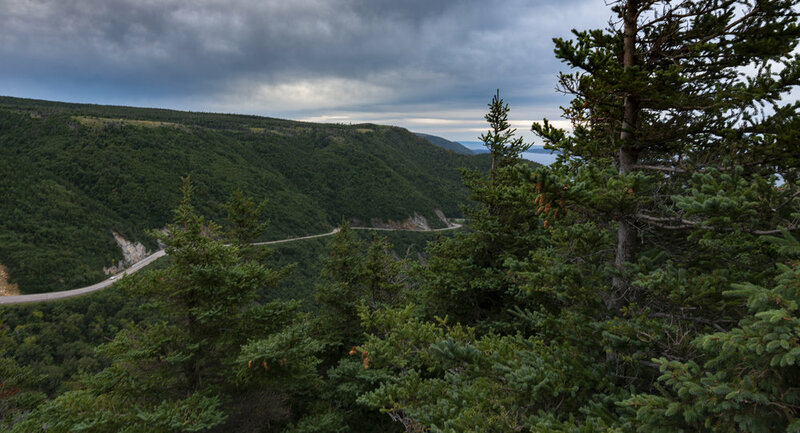 A view of Cape Breton from the Skyline Train along the ridge. A nice walk. The weather has not played so nice and we didn't have much of a sunset but the hike was just what we needed to get the blood flowing. Out on the end of the Skyline Trail it really lived up to it's name as we walked down a ridge with the landscape falling away on each side. If it had been a clear day we would have been walking straight into the sunset but clouds obscured the sun. We headed back actually just before the 'sunset' as the temperature was dropping and the wind was beginning to pick up. As Carol and I walked through the gathering darkness we had high hopes of seeing another moose but none came to play. Four and a half miles on this track made for another six mile day of hiking. We had a stand up supper as the wind had REALLY picked up. It was blowing 30 to 40 MPH when we got back to camp. I installed extra guy lines to the screen house but the wind speed continued to climb and a few huge gusts made it apparent that it was time to take the Clam screen house down. I think we would have lost it otherwise. Man was it ever windy. We made it an early night and turned in no worse for the wear as the rain began to fall. A collection of photos is below, click on any image for a larger view.